Bihar’s Human Chain: Nitish – Lalu held hands for 45 minutes ! Patna: The optics was complete. 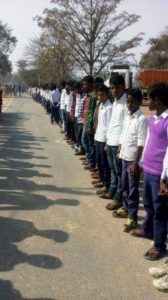 The world’s ‘longest’ human chain was accomplished in Bihar, primarily through the use of government might, such as the education department browbeating colleges and schools into participation, and so on. Of course, Bihar witnesses another ‘spectacle’ in the face of deteriorating governance, but no matter. Bihar today claimed to have formed the world’s longest human chain with Chief Minister Nitish Kumar, political leaders, cutting across party lines, and citizens holding each other’s hand to ‘reaffirm commitment’ towards the liquor ban. Holding Hands : Optical illusion? The 45-minute-long human chain started at 12:15 PM at the Gandhi Maidan in Patna when Chief Minister Nitish Kumar floated colourful balloons, and ended at 1 PM. The chief minister joined hands with RJD supremo Lalu Prasad on the one side and state Legislative Assembly Speaker Vijay Kumar Chaudhary on the other to begin the chain of people to express unity in support of prohibition. Legislative Council Chairman Awdesh Narayan Singh, Deputy Chief Minister Tejaswi Yadav, state Congress President and minister Ashok Choudhary, NCP General Secretary and MP Tariq Anwar and a host of ministers and legislators held each other’s hand at the beginning of the chain which branched to different directions to stretch across Bihar. Opposition BJP which lent support to the human chain joined the queue in Siwan, where their two-day state executive committee meeting is beginning today. Top BJP leaders Sushil Kumar Modi, Union minister of state Ramkripal Yadav, Leader of Opposition in Bihar Assembly Prem Kumar, party national spokesman Shahnawaz Hussain and party MP from Maharajganj Janardan Singh Sigriwal joined hands in Siwan as part of human chain. The CM, Lalu Prasad and other leaders stood in lines to form a map of Bihar in Gandhi Maidan. A picture of liquor bottle with a cross sign was drawn in the middle of this map to give the message against alcohol. Bihar was written in dark black colour in the middle of the map so that a clear picture of the event could be captured through ISRO sattelite, drones and helicopters. To display communal harmony, four children dressed in traditional attires of Hindus, Muslims, Sikhs and Christians stood by side of the CM and Lalu Prasad. The human chain is estimated to cover a distance of 11,292 km involving two crore people. 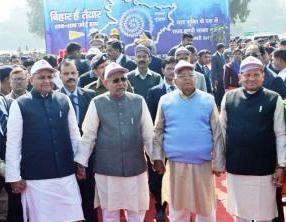 The Bihar human chain is tipped to be the world’s longest so far. The previous record is of 1050-km-long human chain which was formed in Bangladesh in 2004. RJD supremo Lalu Prasad told reporters all parties and citizens in general were together to fight evil of liquor. Congress state President and minister Ashok Choudhary, whose Education department is the organiser of the human chain programme told reporters that it was the biggest social congregation of people in the country after Independence. Kumar, who has taken liquor ban on a mission mode and has been exhorting people through his ongoing ‘Nishchay yatra’ to participate in the human chain, said the ‘unprecedented’ congregation of citizens today was also different from other such human chains in the world. “In other human chains people had come on streets to register protest on some issue but human chain in Bihar was to express support on a positive issue (prohibition),” he added. Lauding people’s participation, the CM said besides leaders of all the parties, farmers, labourers, professionals, those linked with medical work, women and students came on streets to express “jan bhavna” (public sentiment) in support of liquor ban. “Bihar displayed today it is against alcohol,” he claimed. Kumar said human chain would further create a favourable condition for total prohibition and the event would make life difficult for people who still illegally indulged in alcohol trade. “Today’s human chain would also pave way for a handful of people who link boozing with fundamental right to accept prohibition slowly and gradually,” the CM said, adding this also launched a two-month campaign to take Bihar a step forward from prohibition towards making it intoxicants-free. The campaign would end on March 22 as “Bihar day”, he said. Nitish was flanked by Deputy CM Tejashwi Yadav, Chief Secretary Anjali Kumar Singh and state police chief P K Thakur at the press conference. Lending support to human chain after Prime Minister Narendra Modi’s pat to Kumar on prohibition, BJP leaders joined it at Siwan where they have congregated in connection with its two-day state executive meeting. Asked about a few policemen fainting during human chain in Gandhi maidan, the CM said “its not a big issue. “Since 2006 while participating in Independence day I had seen 4-5 policemen having fainted during speech,” he added indicating such things happen. Kumar dedicated the prohibition campaign in the state to 10th Sikh guru Govind Singh whose 350th Prakash Parva ended in the state on January 5 last and centenary celebration of Mahatma Gandhi’s “Champaran satyagraha” against British rule.